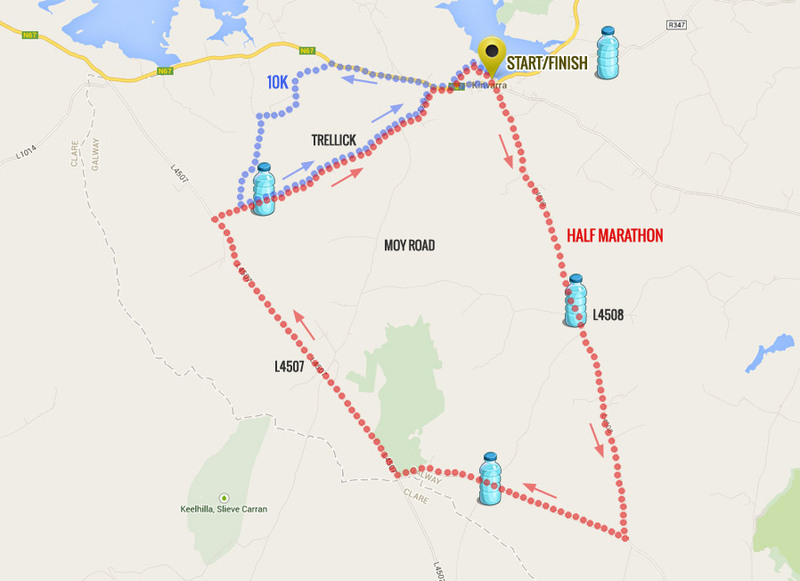 There will be water stations (250ml sports cap bottles) in the full marathon at approximately miles 2, 5.3, 8.7, 12, 15.5, 19.5 and 23.5. There will be three water stations on the half marathon course and one for the 10K. There will also be water at the finish line. The half marathon water stations are at approximately 2.5 miles (4K), 5.8 miles (9.3K) and 9.9 miles (15.9K). The 10K water station is at approximately 5K (3.1 miles). We want to leave Kinvara exactly as we found it so PLEASE dispose of the water bottles either in the bins provided a short distance from the water station OR at a mile or km marker. If you do decide to drop a bottle elsewhere along the route please don’t throw it over a wall or into a ditch.